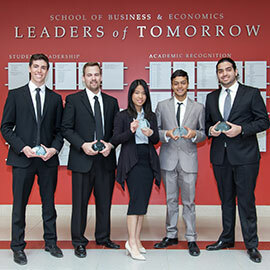 The Lazaridis School of Business and Economics’ winter term Integrated Case Exercise competition, more affectionately known as ICE Week, wrapped up on March 18. Student teams were tasked with making recommendations on how they could grow Molson Coors Canada’s non-alcoholic brewed beverage category. During the previous week, over 450 third-year BBA students were sorted into 100 teams of four or five to present their recommendations for the Toronto-based beverage company. The presentation to a board of Lazaridis School faculty and alumni involved both written and oral presentations. The 20 teams with the best overall performance advanced to the semi-finals, and from them, four finalist teams were selected to present before a panel of senior Molson Coors Canada business executives. Team 76, comprised of students Darren Kitto, Jialing Li, Michael Marshall, Zachary Northey and Shamir Rizvi, came out on top to win. "The winter 2016 ICE case presented a really interesting twist for students," commented Karin Schnarr, an assistant professor of Policy at the Lazaridis School and the case lead for ICE Week. "I know the judges from Molson Coors Canada were very impressed with the creativity and innovation demonstrated by the ICE teams, as well as the obvious enthusiasm they had for the topic!" Throughout the ICE Week competition, BBA students have the opportunity to integrate management disciplines into a real-time problem-solving context while experiencing work-world pressures, developing presentation skills and interacting with business executives. Senior executives from Molson Coors Canada actively participated in the week’s events: holding a two-hour question and answer session with students, and then serving as the final judging panel to select the winning team. The next ICE Week competition will be held in July 2016. If you’re interested in being an alumni judge or in having your company featured in a future ICE case study, please contact Graham McCormick at gmccormick@wlu.ca.